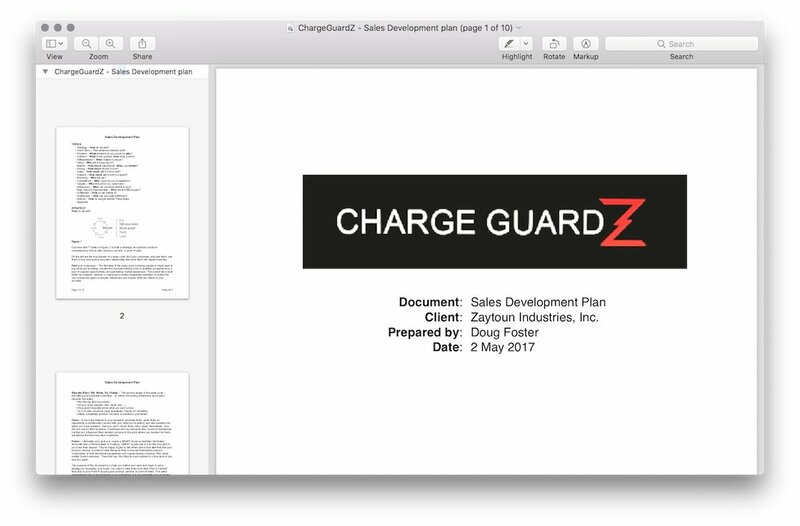 Sales development plan for iPhone cable protector from startup Zaytoun Industries. Story-based methodology covers value, markets, differentiation, branding, pricing, competitors, and distribution strategies; go-to-market section defines priorities and activities. Zaytoun Industries worked with TS3D to commercialize a new innovation - a charging cable protector for iPhones. Since this was Zaytoun's first time selling a high volume commercial product, TS3D contacted me to help them develop a brief, high level marketing strategy. After discussions with Zaytoun & initial research based on their input, a ten page high level marketing strategy was delivered. The strategy uses a story-based methodology and covers (among many things) value, markets, differentiation, branding, pricing, competitors, and distribution strategies. The go-to-market section defines priorities and activities. Only the first four pages of the plan are shown due to the proprietary nature of the material covered.